Babylonians: They were present from 2000 BC to 550 BC. Most of the mathematical work found was between the period 2500 – 1600 BC. Cuneiform Scripts: Sumerians were using form of writting which was based on cuneiform (i.e. wedge-shaped) symbols. 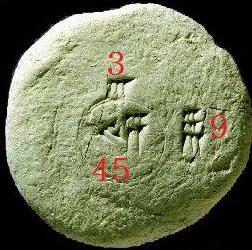 They wrote symbols/alphabets/numerals on wet clay tablets and were allowed to get baked in the hot sun or fire. Many such tablets, not all, have survived today. They had a proper civilization with schools and it is believed that Babylonians students had written most of the tablets as exercises or in class rooms and made an effort to preserve them for references. Various topics the tablets covered are algebra, quadratic equations,fractions, cubic equations, square roots, Pythagorus Triples, geometry but scientists found that they were not very correct in geometry. 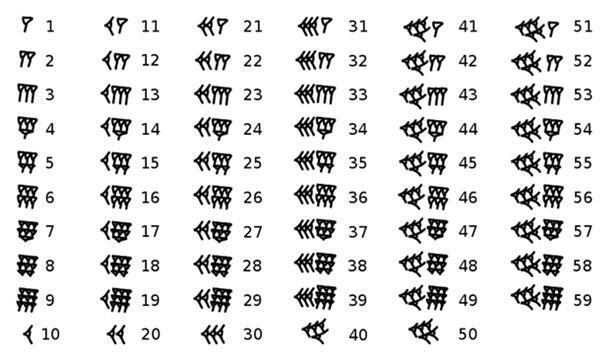 Sumerians and Babylonians used sexagesimal number system i.e. they followed Base 60 pattern (We follow decimal pattern | Base 10) and thay had NO ZERO concept. It is believed that they followed base 60 pattern as 60 is a number which has wide range of factors like 1,2,3,4,5,6,10,12,15,20,30 and 60. They used 2 wedges(“) to represent 0. Eg: 106 were written as 1”6 or 1 6. But no wedges were found if the last digit was 0. Eg: 16 would be written as 16 and 160 would be written as 16 as well. No differentiation was present between them. Babylonians probably didn’t knew the circle has 360 degrees but they successfully subdivided the circle in 360 parts by using the angle of an equilateral triangle as the basic unit and further subdivided into 60 more parts following their sexagesimal numeric system. Babylonians divided a day into 24 hours, hour into 60 minutes, minute into 60 seconds. We follow same today. To write 5h 25′ 30″, i.e. 4 hours, 15 minutes, 10 seconds,they used to write in sexagesimal fraction as 4 15/60 10/3600. We adopt the notation 4; 15, 10 for this sexagesimal number. They had prepared tablets of squares and cubes and they used this tablet in multiplication of numbers. Also, they had prepared tablet for reciprocal of numbers and used it while carrying out division of numbers. 4 43 56 = 4×602 + 43×60 + 56. 10,23,54;32,54= 10×602 + 23×60 + 54 + 32/60 + 54/602. We would have written in decimal format as 10×102 + 23×10 + 54 + 32/10 + 54/102. # Multipication: To carry out multiplication seperate tablets were prepared with squares of numbers up to 59 and the cubes of numbers up to 32. # Division: They also had prepared tablets consisting of reciprocals of many numbers. For calculating ‘a/b’ they followed the concept of a x 1/b. From the reciprocal tables they prepared they used to find 1/b and then multiply it by a to get a/b. If observed carefully they didnt calculate reciprocals of prime numbers except 2, 3 and 5(prob because 60 is divisible by only these prime numbers). For reciprocals of other prime numbers they used to follow technique of proportion and approximation. They would write 1/13 = 7/91 = 7 x (1/91) =(approx.) 7. (1/90) and these values were obtained from the tables. And for obtaining square root they used to check the same squares table in reverse way. Now they used to check the table to get the closest value to RHS and corresponding value of n would be equal to y. From y they used to calculate x. 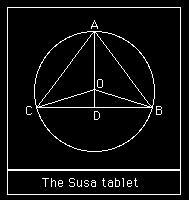 One of the tablets showed that they had some knowledge of the pythagorus theorem (arnd 1500 years before Pythagorus was born). Tablet Plimpton 322 has been found which has the Pythagorus Triples. Tablet has a process to calculate sqrt of 2 using Pythagorus Theorem. 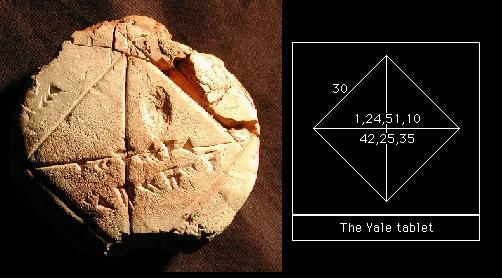 Yale Tablet has a diagram of a square with 30 on one side, the diagonals are drawn in and near the centre is written 1,24,51,10 and 42,25,35 (sexagesimal format). Assuming that the first number is 1; 24,51,10 then converting this to a decimal gives 1.414212963 while v2 = 1.414213562. Calculating 30 × [ 1;24,51,10 ] gives 42;25,35 which is the second number. The diagonal of a square of side 30 is found by multiplying 30 by the approximation to v2. (45-45-90 triangle). Here we have labelled the triangle A, B, C and the centre of the circle is O. The perpendicular AD is drawn from A to meet the side BC. Now the triangle ABD is a right angled triangle so, using Pythagorus theorem AD2 = AB2 – BD2, so AD = 40. 9 is the square of 3.